Padang is the capital city of West Sumatera Province in Indonesia. It is renowned for its “Nasi Padang” and other Padang dishes, such as “Telor Balado” and “Rendang”, which is also well known in some other countries. Apart from the dishes, Padang has also two famous legends, “Siti Nurbaya” and “Malin Kundang”. 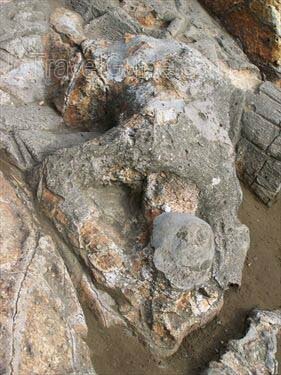 The tomb of Siti Nurbaya can be found on top of Gunung Padang and “the stone of a prodigal son”, Malin Kundang, can be seen in one of Padang’s attractive beaches, Air Manis Beach. The city of Padang covers an area of 690 square-kilometers and is inhabitated by 870,000 populations, as of 2009. 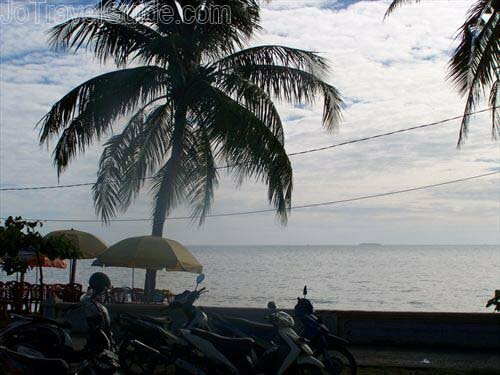 Since it is located in the seashore, Padang temperature can be fairly high (around 30°C to 34°Celcius. There are plenty of interesting beaches here and JoTravelGuide.com covers also Padang’s most visited beach by locals, which is located in the city center, called Padang Beach. Padang is also nicknamed the “Mother Earth” in Indonesia, this is because Padang, or West Sumatera Province in general, has a different culture to the rest of Indonesia, in terms of Patrilineality and Matrilineality. Patrilineality is a common practice in Indonesia, whereas Padang and its region follow the Matrilineality system, where linage is traced through the mother and maternal ancestors; the property is passed down through the female line. 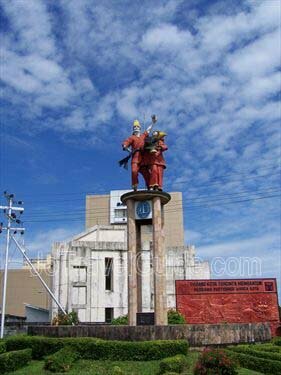 The history of Padang started in the 16th century, when the town of Minangkabau (now Padang) was led by Adityawarman. A century later, the Dutch East Indian Company or known as VOC came and started ‘doing businesses in this town of Minangkabau. After obtaining a permission from “Rang Kayo Kaciak”, a “penghulu” (a village headman or leader), VOC built a large warehouse to store goods around Muara River, where today people can still see a few historical buildings built that year. However, VOC then dominated the politics and trades in Minangkabau, which afterward caused displeasure of the natives. They then attacked the Dutch (VOC) and took over VOC’s warehouses built on the banks of the Muara River. This incident happened on 7 August 1669 and marked as the anniversary day of Padang. Today, Padang has developed into a busy city in West Sumatera, where tourism also takes part as an important sector on its regional economic growth. The natives of the West Sumatera Province are called Minang, and they speak “Minangkabau” dialect. 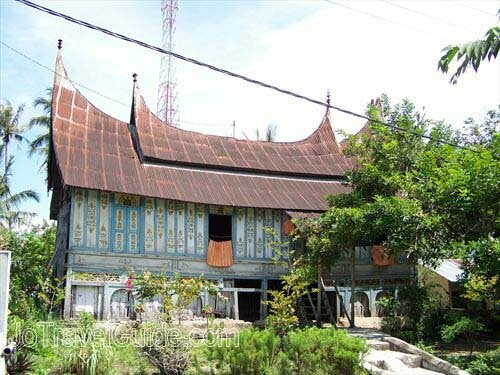 Some of Minang people still live in Minangkabau’s interesting traditional house, called “Rumah Gadang”, which its roof is built resembling water buffalo’s horns. 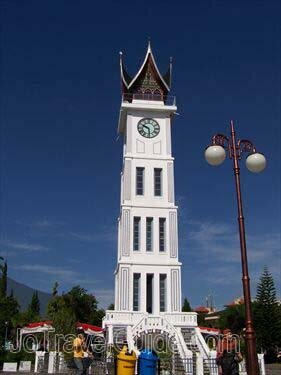 This type of roof is also seen on top of Jam Gadang in Bukittinggi, a giant clock given by the Dutch queen to the Rook Maker, a city controleur during the Dutch colonialism. Now it becomes one of West Sumatera’s landmarks. Japanese caves and Dutch’s Fort de Kock also become interesting places to see in Bukittinggi city alongside the Jam Gadang. Many tourists stop at Padang as a transit city before they drive up to Bukittinggi or to the western part of Padang: Mentawai Islands and Sikuai Island for surfing and diving. From Padang tourists can also visit other heritage sites or just to relax and do fishing in Maninjau Lake or Singkarak Lake. Wherever you come from, there are various adventures await you here. Have a great holiday in Padang and surroundings! Hi Alex, thank you for your visit to our website and your time to write a nice compliment. I am glad if our information can help you travelling to Padang. I wish you always have great travelling moments! It is a best site about Padang that I have read before. Very good and helpful for lonely travellers. Here I found much more local and actual information regarding city. Thanks.